Do you love your hot sauce and want to share that love with the world in a completely harmless and non-invasive way? 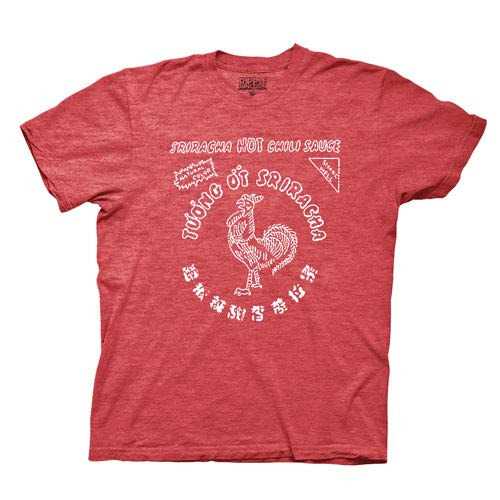 Then this great Sriracha Hot Chili Sauce Bottle Label Red T-Shirt belongs in your wardrobe! Whether you're going out to eat Vietnamese, Mexican, BBQ, Chinese, Thai, or any other food that could use a spicy kick, this great t-shirt that features the image from the front of the Sriracha bottle will show everyone around exactly what sauce you want to perfectly complement the meal and take it to the next level of flavor.